A lot of people who have a massage say afterwards, "I feel WONDERFUL!" But do they know WHY they feel so good? We all know that massage relaxes tight muscles, but why is that so beneficial, and why does it improve the way our bodies function? WHAT HAPPENS WHEN MUSCLES ARE TOO TIGHT? A good analogy of tight muscles is compressing a garden hose, or putting a kink in it. You turn on the tap, and what happens? A little trickle of water comes out the end of the hose! That's similar to what happens in the body. If the muscles are tight they can squeeze or restrict blood vessels, lymphatic vessels and nerves. This handicaps or hinders many vital functions in the body. Also, tight muscles can compress joints, and push fluid out of the cartilage and discs which act as cushion pads between the joints. Soothing massage relaxes the muscles, and as a result many good things start to happen in the body. 1) Blood flow is enhanced, and life-giving, nutrient-rich blood can flow to every part of the body. 2) The lymphatic fluid "bathes" all of the trillions of cells in the body, and transports toxic by-products and wastes back up to the filtration organs in the upper body. 3) The electronic messages from the brain are transmitted through the nerves efficiently. 4) Joints decompress, and cartilage and discs can thicken and rehydrate with fluid. All of this allows the body to function up to its potential! Remember, gravity causes the blood and lymphatic fluid to settle in the lower extremities. In fact, the Lymphatic System DOES NOT have a pump to move it. The blood has the heart to move it throughout the body, but the lymphatic fluid is dependent on movement, massage and inversion to keep it circulating throughout the body. It's also important to realize that our Lymphatic System is the center of our Immune System, which is our body's "line of defense" against bacteria, viruses and degenerative diseases. Did you know that if our Immune System is healthy and working properly, it's less likely that we will get sick with a virus or disease? This is very exciting news! So, we understand how massage helps the blood flow, lymph fluid flow, and the transmission of electronic impulses through the nerves. But how does massage help our joints decompress? Muscles are attached to bones with tendons. Ligaments are used to hold the bones together at the joints, like a lot of rubber bands. When muscles, tendons and ligaments tighten and shorten with age, stress, exercise, and injuries this causes the fluid cushions (cartilage and discs) between the joints to flatten or compress. A good analogy is having a slow leak in our tire on our vehicle. If we don't pump the tire back up, eventually the rim will cut into the rubber tire. It's similar in the body. The cushions between the joints can flatten with tight muscles, and the bones can grind down the cushions until eventually it is bone on bone. This causes pain, loss of movement, compression of nerves, and eventually long-term disability. So what happens when the muscles, tendons, and ligaments are relaxed with massage? The joints can decompress or open up, and the fluid cushions (cartilage and discs) can rehydrate with fluid and regain their proper thickness. This leads to enhanced flexibility, mobility, range of motion, comfort and youthfulness. All of the good things that we notice from massage such as, pain relief, relaxation, tension relief, better sleep, increased work productivity, more energy and clearer thinking, are because the four bodily functions mentioned above have dramatically improved! Massage chairs have come a long way over the years, and are becoming a house hold necessity for many people. Quality massage chairs offer total body massage for the feet, legs, hips, back, shoulders, and neck. Also, air pressure cells are used to help squeeze the fluid from the feet, legs, hands, and arms, and put it back into circulation in the body. Many massage chairs feature built in heat to help the user and their muscles to relax. People can select ‘tapotement’ which is a percussion type of massage, or a ‘kneading’ motion, or a combination of both to help meet their needs. In fact, some quality massage chairs now have 3D technology, which provide three directions of massage – up and down, side to side, and in and out. The 3D movement can help to align and adjust the spine and joints as people are getting their massage. ‘Zero Gravity’ is an important feature to have in a massage chair to help take the load of gravity off the body. Zero gravity cradles the person in a position that minimizes gravity, and takes the load off the back and hips. Zero gravity is a wonderful benefit, and helps recirculate the blood and lymph fluid in the body, and takes the weight off the joints. 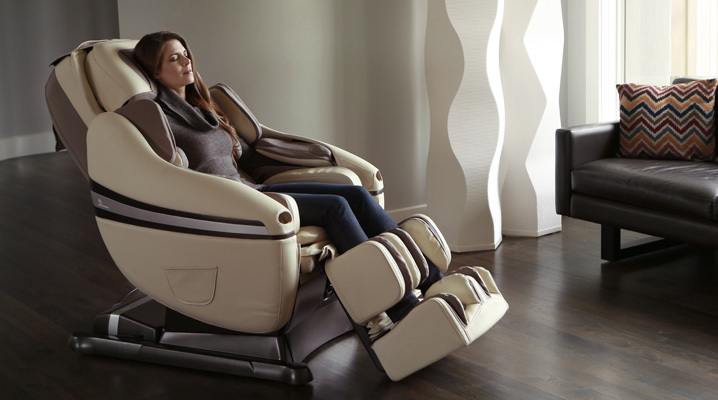 Some people have a ‘Zero Gravity’ chair for their home, but having it built right into your massage chair is a great combination, and doubles the benefits. There are several good reasons to purchase a quality massage chair for your home. 1) People can get more benefits from massage, because they can have a massage on a regular, or even daily basis. 2) It is more affordable over the long-term, versus paying for massage treatments at a clinic. 3) Other family members can benefit from the massage, which provides even greater savings. 4) People can continue to relax after their massage, because they are in their own home, and they don’t need to drive to go home, or to go back to work after their massage. 5) A massage chair is convenient and accessible anytime of the day or night. 6) A massage chair is user friendly, and extremely versatile. Massage chairs can be used in a variety of different ways. Such as a recliner chair, a whole body massage chair, a heated chair, a zero gravity chair, or simply as a comfortable chair! Massage is a proven scientific therapy that goes back thousands of years, and has always been practiced for the remarkable benefits it provides for the body. As people get older and go through more each year of their life, they usually start to suffer more and more with stiffness, soreness, restriction of movement, a decline in posture and alignment, and the tightening of muscles and ligaments in the body. When people start to enjoy soothing massage, they begin to experience relief, flexibility, mobility and youthfulness. We also find that people who sit, or stand a lot throughout the day develop an excessive build up of blood and lymph fluid in their legs and feet. This is because gravity causes fluid to settle or pool in the lower body. Also people are more sedentary with their work and jobs nowadays, so gravity causes everything to go ‘south’ in the body. That’s why people suffer from fluid retention, varicose veins, swollen ankles, etc. When the blood and lymph fluid gets recirculated to the upper body through exercise, inversion, or massage then it can be filtered, cleaned and re-oxygenated. That in itself is a great benefit. Massage has become an increasing need and necessity in our day and age. With many people having office jobs, they find themselves sitting in front of a computer for hours everyday. This creates a lot of tension and stress in the back, shoulders, arms and neck, which can lead to head aches, discomfort, and pain throughout the body. Relaxing all the muscles provides a wonderful relief, and is important for the body to function properly. 1) Relaxes tight muscles and joints to leave them supple and comfortable. 2) Massage reduces recovery time, and speeds up recuperation dramatically. 3) Promotes decompression of the joints, which improves posture and flexibility. 7) Better overall function of the glands, organs, muscles and joints. 8) Improves three main body functions, which are: blood flow, lymph flow, and nerve supply throughout the body. Click Here to Explore our Professional Massage Chairs!